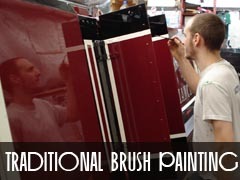 Hand painting all types of boats and specialising in the restoration/replication of historical working narrowboats, the company is based at Brinklow Boat Services building and fitting yard which is an established boatyard well known for it's quality in this particular area of the industry. 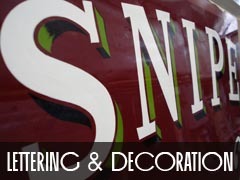 Full shotblasting services available for hull and top sides at our heated facility in Leicestershire. Two component Epoxy Pitch is apllied after blasting. Bitumen blacking services also at Brinklow dry dock which envolves preparaton of the hull using hand tools and then applying single component tar based paints. 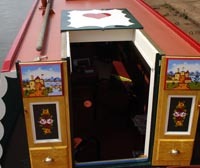 Acomplised signwriting and traditional geometric designs can be applied here at Brinklow, aswell as beautiful illustrations painted straight on to your boat.